I love sate (satay), Indonesia's version of grilled meat on a skewer. To give you some sense of how much I love sate, I've already eaten it twice since I've been here, and I've only had four meals (breakfast doesn't count). 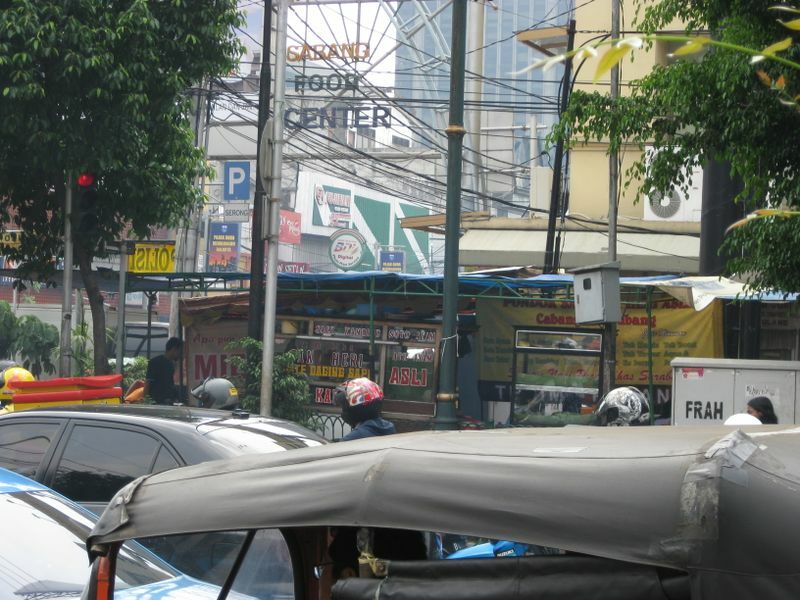 I'm always looking for the best sate around and decided that it would be fun to do a comparison of two well-loved sate places in my neighborhood, Sate Jaya Agung (Great Victory Satay) and Pondok Sate Pak Heri (Mr. Harry's Sate Stand). 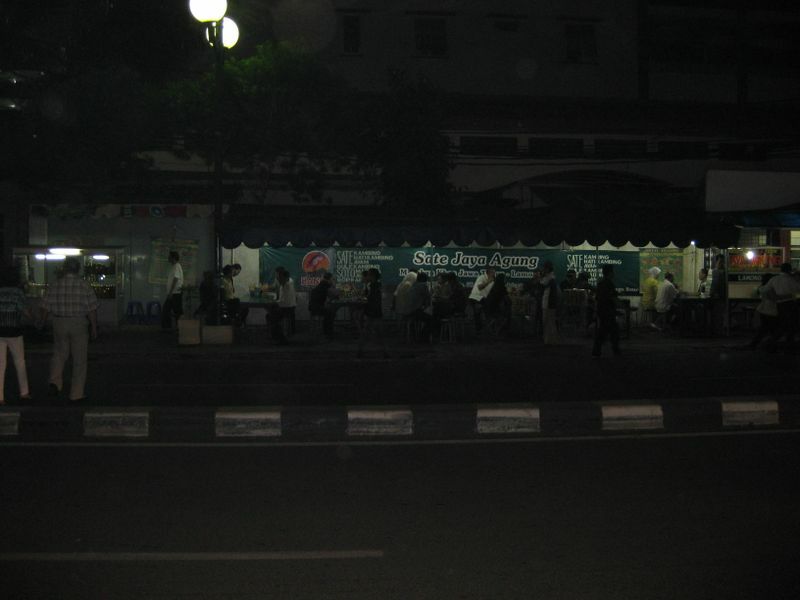 There's a third one near there, Sate Sabang, which I have yet to try but will get to soon, maybe this weekend. Anyway, here are my notes. I decided that to be fair, I'd have mutton sate in both places. (Mutton is my favorite kind of sate.). 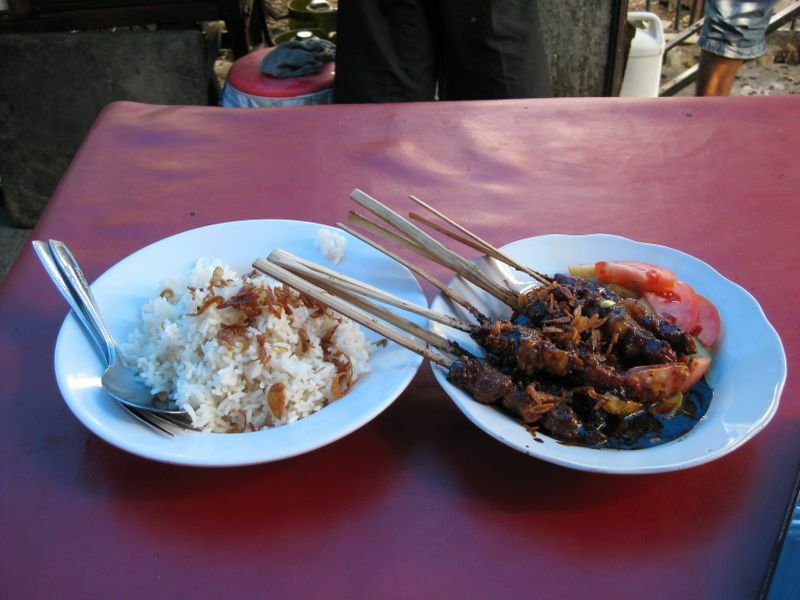 We'll start with Sate Jaya Agung, which is my sentimental favorite. It's the first real sate that I ever tried here and they seem to know me there. They do a brisk business throughout the day. An order of sate, white rice, and a bottled water costs about $2.50, which is pretty good if not the very cheapest way to eat. When you order, this is what you get. 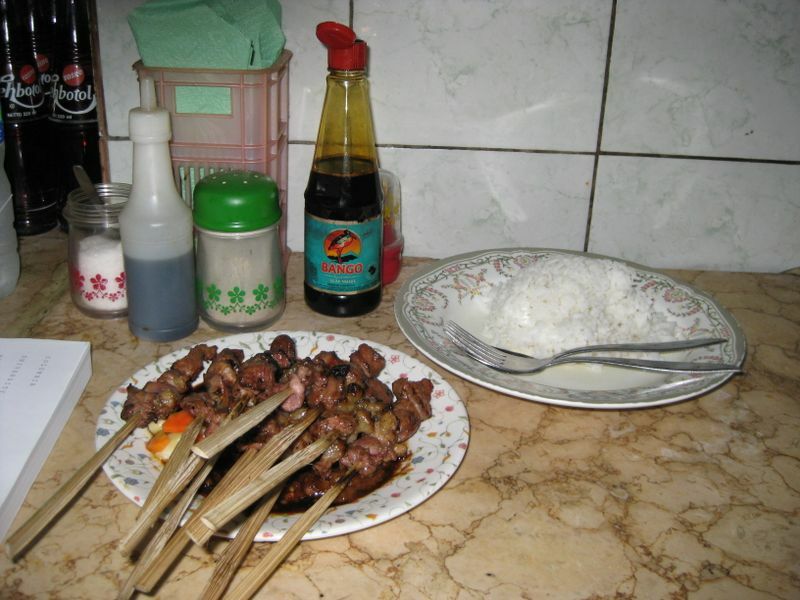 That's about ten skewers of mutton–skewers are made out of fractured and dried bamboo links–along with some rice and a bit of pickled carrot and cucumber (acar). Note also that there are condiments available, including sweet soy sauce (kecap manis), a vinegary kind of salty soy sauce, and MSG (which you can use like salt). Underneath the sate is a sauce made out of kecap manis, mashed peanuts, oil (lots of it), and spices. The idea is that you sort of smear the sate in the sauce, then eat it with the rice. Yum. My rating: A-. I love the sauce here: sweet and rich but subtle. The meat is tough, but that's about what you can expect. What's nice is that they don't skimp on the really fatty pieces, which are the real treats. The big problem here is that the acar is lame. There's not enough of it and it's limp and disappointing. Now let's move to its competitor across the street. This place comes more highly recommended than the other one. What you get when you order, I must admit, certainly does look better. The rice, you see, has fried shallots on it, as do the sate skewers. You also can see that instead of acar, you get real fresh vegetables (cucumber, carrots, tomatoes, birds-eye chilies) with the sate here. My rating: B+. I just don't think that this place stands up as well. The fresh vegetables are a huge improvement, as are the shallots–they really give everything an extra depth of flavor that Sate Jaya Agung does not have. But, there are two flaws. (1) The sauce is far too oily and doesn't appear to have any peanuts in it. I suspect that it's not really traditional to have a peanuty sauce for mutton sate, but I miss it anyway. The sauce was basically palm oil plus kecap, not my favorite and not particularly inspiring. Plus, (2) the meat was more uneven. The fatty pieces were just fat–I don't mind this too much, actually–but the lean pieces were waaaaay to chewy, and I got a crunchy bit in one of them. A big no-no. I think you need to start an Indo version of Road Food. Can you imagine? These would be a good place to start. Keep the pictures coming, I can almost remember the smells looking at them!